Obalufon mask. Ife, Nigeria. Early 14th century. © Karin L. Wills/Museum for African Art/National Commission for Museums and Monuments, Nigeria. LONDON.- This spring, two major exhibitions at the British Museum will explore two important artistic traditions which flourished at the same time in different part of the worlds. Kingdom of Ife: Sculptures from West Africa (4th March - 6th June 2010) will tell the story of the legendary city of Ife through some of the most refined and beautiful sculptures ever to be found in Africa, created between the 12th and 15th centuries. Meanwhile Fra Angelico to Leonardo: Italian Renaissance Drawings (22 April - 25 July 2010) will bring together the finest group of Italian drawings to be seen in this country for over seventy years, featuring 100 works by artists such as Fra Angelico, Botticelli, Leonardo da Vinci, Michelangelo and Titian. 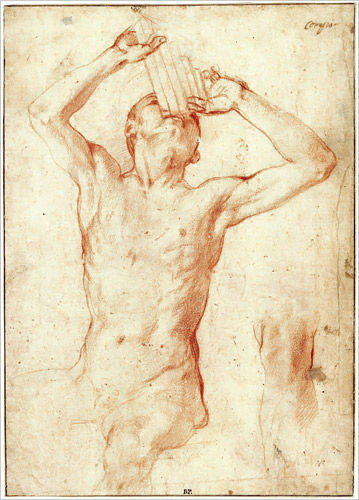 The exhibition will focus on the period between 1400 and 1510 and is a unique collaboration between the British Museum and the Uffizi Gallery in Florence. Kingdom of Ife: sculptures from West Africa will tell the story of the legendary city of Ife (pronounced ee-feh) through some of the most refined and beautiful sculptures ever to be found in Africa. Ife is today regarded as the spiritual heartland of the Yoruba people living in Nigeria, the Republic of Benin and their many descendants around the world. The exhibition will feature nearly 100 superb pieces of Ife sculpture, most of which have never been seen in the UK before, and have been drawn almost entirely from the magnificent collections of the National Commission for Museums and Monuments, Nigeria. The British Museum is planning a series of Africa-related events, activities and displays to coincide with the 50th anniversary of African Independence celebrations in 2010. Ife is rightly regarded as the birthplace of some of the highest achievements of African art and culture, combining technical accomplishment with strong aesthetic appeal. From the 12th to the 15th centuries, Ife flourished as a powerful, cosmopolitan and wealthy city-state in West Africa, in what is now modern Nigeria. It was an influential centre of trade connected to extensive local and long-distance trade networks which enabled the region to prosper. Ife developed a refined and highly naturalistic sculptural tradition in stone, terracotta, brass and copper-alloy to create a style unlike any in Africa at the time. The human figures portray a wide cross-section of Ife society and include depictions of youth and old age, health and disease, suffering and serenity. 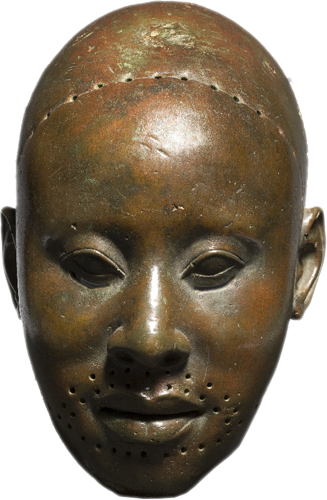 The almost pure copper mask of Obalufon II, an early Ooni (king) of Ife is one of the finest images of royal power from Ife. 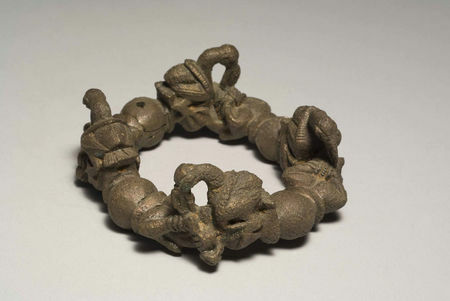 According to Yoruba myth, Ife was the centre of the creation of the world and all mankind. Ife was home to many sacred groves located in the city’s forests. Two groves in particular have revealed numerous sculptures: the Ore Grove with its stone monoliths, human and animal figures and the Iwinrin Grove which is associated with terracotta heads and fragments from life-size figures. Other sites have revealed spectacular pieces with royal associations including the only known complete king figure and an exquisite terracotta head, possibly portraying a queen both from Ita Yemoo. A terracotta elephant and a hippopotamus head lavishly adorned with beaded regalia come from the royal burial site of Lafogido. The figurative terracotta sculptures, which represent the largest group of works, capture the diverse nature of Ife society at the time. Several terracotta heads bear facial striations suggesting cultural markings, some possibly from groups outside Ife. Some heads appear to depict women wearing regalia or jewellery indicating their high status. 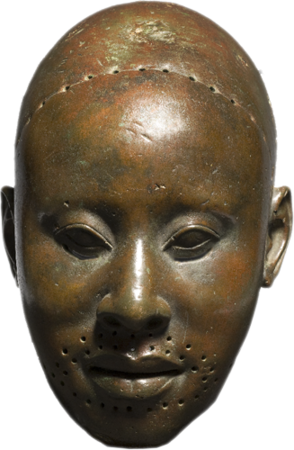 Also on display are almost life-size copper alloy heads which reveal an idealized, naturalistic uniformity although each head has notable individual characteristics. 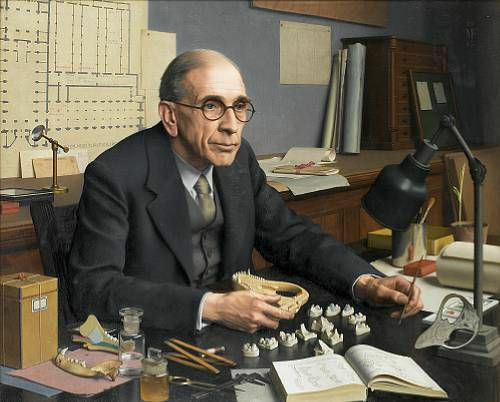 It is suggested that they were produced over a relatively short period of time, maybe in a single workshop. These heads are believed to be associated with the coronation or the accession rituals of new rulers of Yoruba city-states which owed allegiance to Ife. Today Ife remains a major spiritual and religious centre for the Yoruba people. Some of its shrines and groves are still in use and rituals to key gods are performed regularly. Works of art from Ife have become iconic symbols of regional and national unity, and of pan-African identity. Since Independence in 1960 enthusiasm for copies or reproductions of heritage items with nostalgic associations has increased. The ‘Ori Olokun’ head was chosen as the logo for the All-Africa Games held in Lagos in 1973 and has been adopted as the logo of numerous commercial, educational and financial institutions. Such images have become universal symbols of African heritage. Seated figure, Tada, copper. Early 14th century. © Karin L. Wills/Museum for African Art/National Commission for Museums and Monuments, Nigeria. Important vase meiping. marque da ming wanli nian zhi. époque wanli.